With over 35,000 miles of coastline that includes two of the world’s largest reef systems, the Great Barrier Reef and Ningaloo Reef, it comes as no surprise that there are great scuba diving spots in Australia. When you talk about the top 5 scuba diving locations in Australia, you are also talking about the world’s top diving locations. These five are just the tip of the iceberg. We may as well start with Queensland’s Yongala shipwreck site, since it is often called the world’s number one scuba diving spot. In 1911, the Yongala sank during a cyclone, killing 122 passengers and crew, a racehorse named Moonshine and a bull. 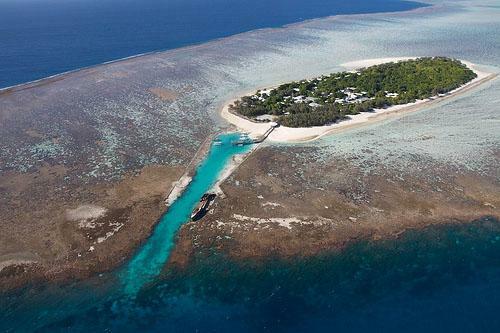 The 357 foot vessel now rests on the bottom of the Great Barrier Reef, 55 miles southeast of Townsville. 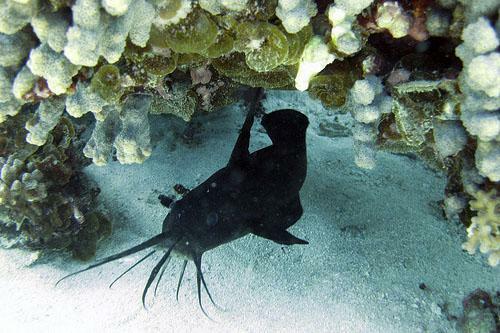 Finally given official protection in 1981, the Yongala now attracts scuba divers from around the world. Of course, part of the attraction is the wreck itself, but besides that, divers are amazed by the almost psychedelic colours of the corals and tropical fish that abound in the crystal clear waters around the wreck and the variety and abundance of sea life, including giant manta rays, tiger sharks and turtles. Not exactly on the tourist map, but high on every serious scuba divers tick list of scuba diving destinations, Osprey Reef is located about 135 miles dead east from Far North Queensland’s Cape Melville. The roughly oval reef occupies an area of about 120 square miles and as remote as it is, divers rarely if ever are troubled by throngs of tourists frightening the fish away or destroying the fragile reef ecosystem. Not for the faint of heart or for amateurs, two of the most popular diving spots on Osprey Reef are the Cod Hole and the Shark Feed. 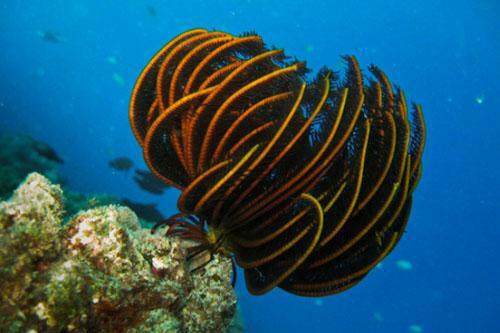 On a gentler, scale, the soft corals are said to be some of the world’s most spectacular. Just eight miles south of Osprey, Shark Reef is considered by some divers to be even better, if that’s possible. If you’re planning on diving on Osprey Reef, there are four to seven day tours available that will surely qualify as an experience of a lifetime. A 160 mile long fringing reef in north Western Australia, Ningaloo Reef arguably should be as famous as the Great Barrier Reef. Fortunately for those who prefer a Robinson Crusoe environment (with modern amenities easily available), Ningaloo Reef is not as famous or frequently visited as its Queensland neighbor. The beauty of Ningaloo Reef, aside from its abundance of sea life, is the fact that even amateur scuba divers and snorkelers can experience it in all its glory. The biggest diving drawcard in Ningaloo Reef is the opportunity to get up close and personal with the whale sharks that call the reef home. While this may sound suicidal, these are actually some of the friendliest, most docile creatures on earth. The town of Exmouth, where you will start your adventure, isn’t a large town by any means, but it has everything you need for an amazing scuba diving adventure. Although it’s an island, Rottnest Island lies just 12 miles offshore of Perth, the capital of WA and because of its close proximity to it is often called the best urban dive spot in Australia. Just 11 square miles in size, Rottnest is nonetheless packed with great diving opportunities with shipwrecks, limestone caves and an abundance of temperate to cool water species of sea life being just some of the underwater attractions surrounding the island. In all, there are over 100 recognized dive sites at depths ranging from 3 feet to 30 feet and even more if you add in the deep water sites. One of the most famous spots on the island is Fishhook Bay’s sunken grotto. 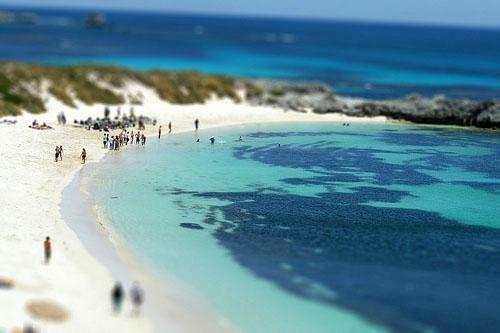 While Rottnest Island is frequently visited, there are no roads or cars on the island, so keep that in mind when you are packing your gear and making your travel arrangements. If you want to combine luxury with a fantastic diving experience, you can’t get past Heron Island. Not exactly a secret spot, the legendary Jacques Cousteau listed it as one of his top ten favorite diving sites. Tiny Heron Island is home to just one luxurious eco-resort, making it an ideal destination for scuba diving loving honeymooners. 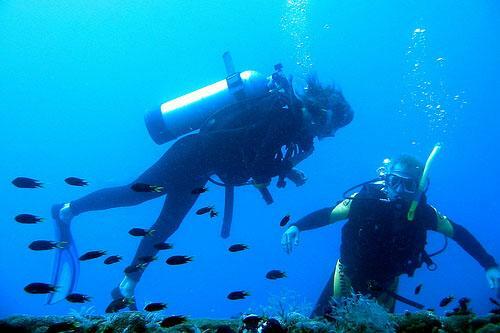 Even if one scuba dives and the other does not, there are plenty of great snorkelling spots within a stone’s throw of any of the stunning beaches and coves around the island and it is an ideal place to get a beginner hooked on scuba diving. A number of easily accessible, shallow dives are within a short distance of shore and diving tours to more remote locations can be arranged. While not a budget trip, everything you could possibly want is at your fingertips on Heron Island and you’ll remember the experience long after the cost of your vacation is forgotten. Rob Schneider the author of the “Top five scuba diving locations in Australia” writes for Hotels-Fairy.com from the beautiful Melbourne about popular things to do and see in Australia. If planning on visiting Australia you will find sunshine coast accommodation and popular diving spots along the Queensland coast.